Phoenix Labs: The Few, The Proud, The Industrialists with teeth! I've been a member of Phoenix Propulsion Labs for most of my EVE career. I've written in the past how important it is to quickly join the right corporation in EVE in order to enjoy the game to its full potential. Let's face it, EVE is an MMOG, a real Massively Multiplayer Online Game, one where the social element of these game is most prominent. Not that you can't play the game solo, but it's a no easy task, and doesn't provide the support a good corp will. In my case, that corporation is Phoenix Labs. Shortly after joining the corp, I had a chance to meet these fine folks in person during the EVE Gathering in Vegas in mid-2006. Recently, I interviewed our Human Resources Officer, Isuridae, and gave him the chance to showcase this amazing corp I'm proud to be of! The interview is below. What is Phoenix Propulsion Labs (PPL)? What sort of industry does PPL perform? PPL is engaged heavily in T2 and T3 manufacturing of items ranging from rigs and modules to starships and drones. We also manage a good deal of capital ship production. That’s a good question, I am glad you asked. PPL is a socialistic corp in that the means of production and distribution of goods is owned by the corp. All assets belong to the corp. And our Tax rate is 99%. We have a military rank system with promotions based on merit. That sounds very restrictive for pilots, how do they make money? The corps provides its pilots with anything they require, thus the burden of constantly grinding for ISK is relieved. Pilots are then free to pursue the activities they enjoy, rather than wasting their energies. All we ask of our pilots is that they maintain a good level of activity, and participate in corp operations when required. Is PPL part of an alliance? At present no, though we do see an eventual return to a 0.0 based alliance. It is our hope that with the Dominion expansion, the alliances will begin to see the worth of a dedicated industrial corp. This corp, working with a couple others in what was then FIX alliance, is responsible for the construction of most of the outposts in the Querious region. 3-FCK, I1Y, and 49U to name a few. Why would a capsuleer join PPL? PPL is very much a family of mature pilots that value the principles of teamwork, honor, integrity, and commitment. If you are looking for an experience greater than just being out for yourself, wish to be part of a cohesive team working towards a common goal. And want to have fun doing it. PPL may be the corp for you. First and foremost to provide our pilots with a fun and rewarding experience and secondly to be recognized as the preeminent industrial corp in EVE. Applications can be submitted on our corporate website. I review the applications and then contact you in-game for an interview. Out of the 6 Star Wars films, there are only 2 I hold way up high as some of the ultimate science fiction movies: Star Wars and The Empire Strikes Back. I never liked the Ewoks and Jar Jar can go where the moon don't shine! But, having recently come across the IMPS series, I've gotta say, this is definitely my kind of Star Wars! Now, if anyone could do something like that within the EVE lore, I'd love to see it! Hell I'd even pay to see it! A long long time ago, in what almost feels like a galaxy away, I used to log into EVE Online 40 hours a week, on average. New Eden was a familiar site to me, the music playing in the background was well known, the sound of my ship getting permission to dock or warping was reassuring. I did all this gaming while my better-half, who needed a lot of rest, was asleep. Late at night or early on the week-ends you would normally see me fly the space highways. 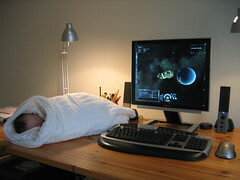 All these hours roaming the universe barely affected my social activities - My Gaming Life was in balance with Real Life. Then we decided to produce a half-clone, and thus MiniCK was born. At first, she had very little affect on my gameplay. I would wrap her up from time to time and set her on my desk next to the monitor as I flew across space. Things where the usual. But with time, things started to change. All of a sudden my week-end mornings started to be more about Baby Einstein, or Dora the Explorer than about EVE. And then the evenings started to shorten as MiniCK stayed up longer and longer. Eventually a MiniCK2 was in the works, which meant even less time for gaming as my better-half worked on various production runs for this future capsuleer. Eventually MiniCK2 made the typical geek "Hello World" announcement, and the remaining gaming activity I had just went out the door. These days, I'm lucky if I'm able to game 5 hours a week, some of which are spent in New Eden. Since I can't pause EVE in the middle of a combat, whether PvE or PvP, games such as Defense Grid or Torchlight have made their way into my gaming habit these days. I do know that eventually I'll have more time to myself, but these days I just don't see how I can play EVE, blog more than I'm doing right now, and still be a dad, a husband and make a living, which will always come first. Just to give you an example, in between the last 2 paragraphs I've had to run back up to the 2nd floor (from the basement where my office is) to try to get MiniCK2, who's still awake and hungry at 11:15 PM, to sleep. And my day started at 5:50 AM this morning with a request from MiniCK to watch Zoboomafoo. Are you getting the big picture here! Don't get me wrong, I'm not trying to complain, or seek pity here. I'm simply trying to put things in perspective so that you may understand why I'm not blogging as much as in the past, or haven't been policing the EVE Blog Pack as I should. I've also come under fire for the types of post I'm doing and the lack of EVE content on my blog. Understand that it's much easier to blog about the game and my other geeky interests then it is to play the game - the first can be done from work during lunch, or whenever I get a few minutes to myself, whereas the other can't. But things should change in about 3 weeks, when I start my paternity leave and am off for 5 weeks. Though I'll be enjoying the opportunity to interact with MiniCK2, I'll also have time to catch-up on my gaming, blogging and podcasting. I've got about 2 dozen posts to be polished up before they go live, and many more in the works. I also want to promote my CrazyKinux's Musing Fan page on Facebook, and grow the community there. There are things I want to do with the EVE Banter and the Pack, and so much more. So all I'm saying is bare with me! This is a busy period of life, one that I want to fully enjoy, even if it means a little less gaming and blogging.